Let someone else do the driving to #PowerBeerFest -- We've partnered with Lyft to provide 50% off a ride to or from the SoWa Power Station on April 28th! Enter coupon code POWERBEER in the Promos section of your Lyft app to receive the discount. Get your tickets today! 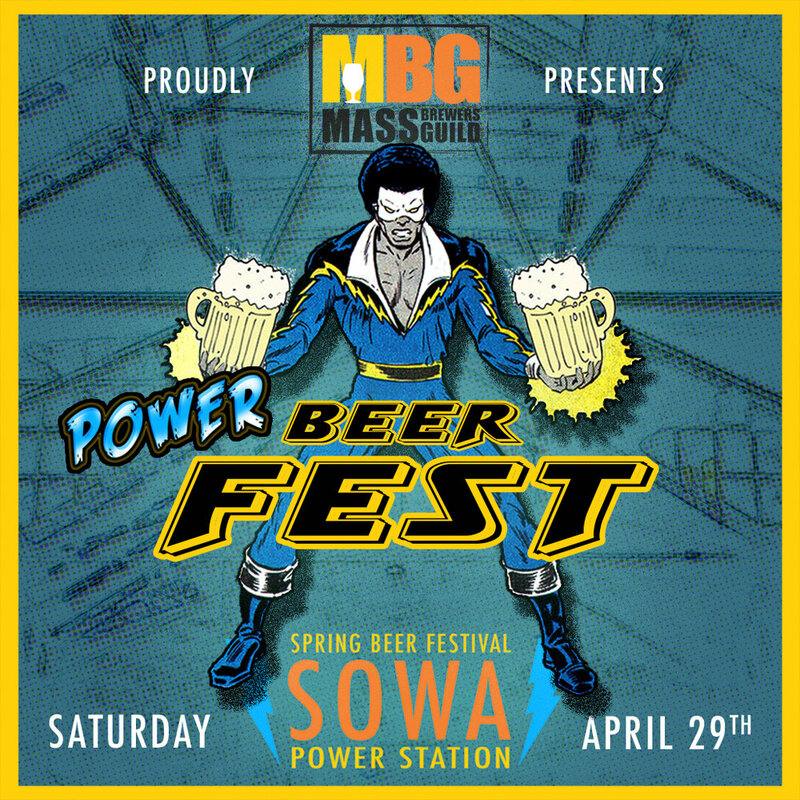 The Mass Brewers Guild brings its successful Power Beer Fest back to the SoWa Power Station for a second year to showcase more than 50 local breweries, all under one roof. The event expects to draw 2,000 craft beer lovers to its two-session sequel that will be held on Saturday, April 28 from 1 to 4:30 p.m. and 6 to 9:30 p.m.
All proceeds from the ticket sales of Power Beer Fest will support the Mass Brewers Guild, the state’s nonprofit organization that works to protect and promote the interests of craft brewers across the Commonwealth. This is the only beer festival run by brewers, for brewers. Tickets are $55 each. Not all heroes wear capes. The following guardians of craft beer expected to pack a powerful taste-punch include: Amherst Brewing, Battle Road Brewing Company, Big Elm Brewing, Bone Up Brewing Company, Cape Cod Beer, Castle Island Brewing Co, CraftRoots Brewing, Devil's Purse Brewing Company, Exhibit 'A' Brewing Company, Flying Dreams Brewing Co., Greater Good Imperial Brewing Co., Hopster's Brewing, Idle Hands Craft Ales, Independent Fermentations (IndieFerm), Jack's Abby Craft Lagers, Lamplighter Brewing Co., Lookout Farm Brewing Co., Mayflower Brewing Company, Medusa Brewing Co, Merrimack Ales, Moon Hill Brewing, Night Shift Brewing, Plymouth Beer Company, River Styx Brewing, RiverWalk Brewing Co., Samuel Adams Boston Brewery, Second Wind Brewing Company, Shovel Town Brewery, Springdale, Start Line Brewing, The People's Pint, True North Ale Company, Turtle Swamp Brewing, Untold Brewing, Wachusett Brewing Company, Widowmaker Brewing, Winter Hill Brewing Company and Wormtown brewery. More breweries are expected to join Power Beer Fest’s forces in the coming weeks. “We are excited to return to the SoWa Power Station and put on another great beer show for our fans to highlight the strength and power of our industry,” says Katie Stinchon, executive director of the Mass Brewers Guild. “Our craft breweries drive traffic and tourism to the Commonwealth, revitalize downtown communities and employ more than 3,000 locals – not to mention produce amazing world-class beer. We look forward to another community focused event where the love of locally made beer is front and center.” Last year, Power Beer Fest raised $37,000 for the Mass Brewers Guild. The nonprofit hopes to raise $50,000 in 2018. From Cape Cod Beer to Barrington Brewery, there is a brewery in every corner and region of the state, with 154 active breweries across the Commonwealth. Thirty additional breweries are slated to open in 2018. When these powers combine, its sure to be a good time. For more information, or to purchase tickets to Power Beer Fest, visit https://powerbeerfest2018.eventbrite.com. Power Beer Fest Is Coming! Tickets Are Now On Sale! More than 50 Massachusetts brewers are coming together to launch the first ever, “Power Beer Fest,” on Saturday, April 29 at the SoWa Power Station. The two-session festival -- 1 to 4:30 p.m. and 6 to 9:30 p.m. -- will kick-off the season opening of the SoWa Open Market located at 540 Harrison Ave, Boston, MA 02118. Proceeds of each sale will benefit the Massachusetts Brewers Guild, a nonprofit organization that protects and promotes the interests of craft brewers across the Commonwealth. Power Beer Fest is the only beer event in the state organized by Massachusetts Craft Brewers to raise funds to create educational and marketing programs for local breweries, as well as support its government affairs work at the legislative level. The Massachusetts Craft beer scene is a power house industry with more than 122 breweries across the state. Breweries employ locals, drive traffic and tourism to the Commonwealth and pour world-class craft beer to thirsty locals and travelers. Massachusetts’ breweries are ranked among the best in the world, country and region, with accolades and awards being announced weekly.